These three days, which the Church calls 'Great' and 'Holy' have within the liturgical development of the Holy Week a very definite purpose. They place all its celebrations in the perspective of End ; they remind us of the eschatological meaning of Pascha. So often Holy Week is considered one of the "beautiful traditions" or "customs," a self-evident "part" of our calendar. We take it for granted and enjoy it as a cherished annual event which we have "observed" since childhood, we admire the beauty of its services, the pageantry of its rites and, last but not least, we like the fuss about the paschal table. And then, when all this is done we resume our normal life. By the death of Jesus the "normal" world, and "normal" life were irrevocably condemned. Or rather they revealed their true and abnormal inability to receive the Light, the terrible power of evil in them. "Now is the Judgment of this world" (John 12:31). The Pascha of Jesus signified its end to "this world" and it has been at its end since then. This end can last for hundreds of centuries; this does not alter the nature of time in which we live as the "last time." "The fashion of this world passeth away..." (I Cor. 7:31). Pascha means passover, passage. The feast of Passover was for the Jews the annual commemoration of their whole history as salvation, and of salvation as passage from the slavery of Egypt into freedom, from exile into the promised land. It was also the anticipation of the ultimate passage - into the Kingdom of God. And Christ was the fulfillment of Pascha. He performed the ultimate passage: from death into life, from this "old world" into the new world into the new time of the Kingdom. And he opened the possibility of this passage to us. Living in "this world" we can already be "not of this world," i.e. be free from slavery to death and sin, partakers of the "world to come." But for this we must also perform our own passage, we must condemn the old Adam in us, we must put on Christ in the baptismal death and have our true life hidden in God with Christ, in the "world to come...."
Behold the Bridegroom comes at midnight, And blessed is the servant whom He shall find watching, And again unworthy is the servant whom He shall find heedless. Beware, therefore, O my soul, do not be weighed down with sleep, Lest you be given up to death and lest you be shut out of the Kingdom. But rouse yourself crying: Holy, Holy, Holy, are You, O our God! Through the Theotokos have mercy on us! Midnight is the moment when the old day comes to its end and a new day begins. It is thus the symbol of the time in which we live as Christians. For, on the one hand, the Church is still in this world, sharing in its weaknesses and tragedies. Yet, on the other hand, her true being is not of this world, for she is the Bride of Christ and her mission is to announce and to reveal the coming of the Kingdom and of the new day. Her life is a perpetual watching and expectation, a vigil pointed at the dawn of this new day. But we know how strong is still our attachment to the "old day," to the world with its passions and sins. We know how deeply we still belong to "this world." We have seen the light, 'We know Christ, we have heard about the peace and joy of the new life in Him, and yet the world holds us in its slavery. 2. The same theme develops further in the Gospel readings of these days. First of all, the entire text of the four Gospels (up to John 13: 31) is read at the Hours (1st, 3rd, 6th and 9th). This recapitulation shows that the Cross is the climax of the whole life and ministry of Jesus, the Key to their proper understanding. Everything in the Gospel leads to this ultimate hour of Jesus and everything is to be understood in its light. Then, each service has its special Gospel lesson. On Tuesday: At Matins: Matthew 22: 15-23, 39. Condemnation of Pharisees, i.e. of the blind and hypocritical religion, of those who think they are the leaders of man and the light of the world, but who in fact "shut up the Kingdom of heaven to men." At the Presanctified Liturgy: Matthew 24: 36-26, 2. The End again and the parables of the End: the ten wise virgins who had enough oil in their lamps and the ten foolish ones who were not admitted to the bridal banquet; the parable of ten talents ". . . Therefore be ye also ready, for in such an hour as ye think not the Son of Man cometh." And, finally the Last Judgment. 4. Throughout the whole Lent the two books of the Old Testament read at Vespers were Genesis and Proverbs. With the beginning of Holy Week they are replaced by Exodus and Job. Exodus is the story of Israel's liberation from Egyptian slavery, of their Passover. It prepares us for the understanding of Christ's exodus to His Father, of His fulfillment of the whole history of salvation. 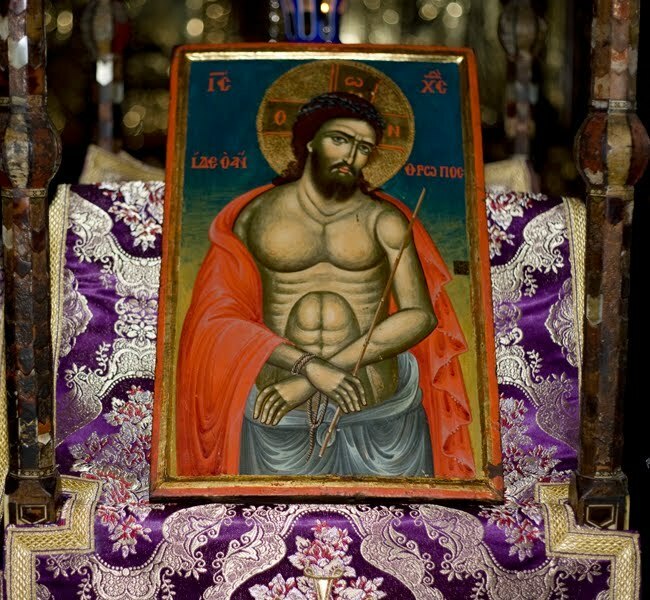 Job, the Sufferer, is the Old Testament icon of Christ. This reading announces the great mystery of Christ's sufferings, obedience and sacrifice. 5. The liturgical structure of these three days is still of the Lenten type. It includes, therefore, the prayer of St Ephrem the Syrian with prostrations, the augmented reading of the Psalter, the Liturgy of the Presanctified Gifts and the Lenten liturgical chant. We are still in the time of repentance for repentance alone makes us partakers of the Pascha of Our Lord, opens to us the doors of the Paschal banquet. And then, on Great and Holy Wednesday, as the last Liturgy of the Presanctified Gifts is about to be completed, after the Holy Gifts have been removed from the altar, the priest reads for the last time the Prayer of St Ephrem. At this moment, the preparation comes to an end. The Lord summons us now to His Last Supper.